Your sister’s birthday is here again, and you want to remind her not only of how important she is to you but also inspire her to approach the future with confidence. 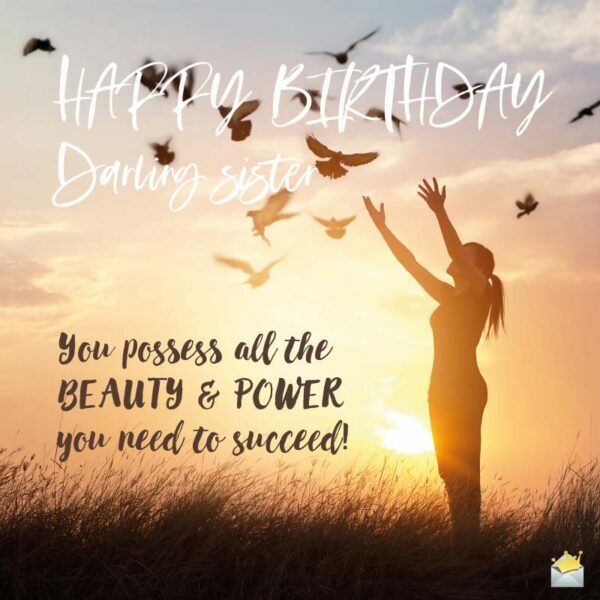 Here are some truly inspirational birthday messages for sister you can use in encouraging her stay motivated and have a positive attitude in life. Sis, as you become older, it is very important that you find balance in your life. So my birthday wish for you is that you take your time, seek balance and enjoy the priceless benefits thereof. 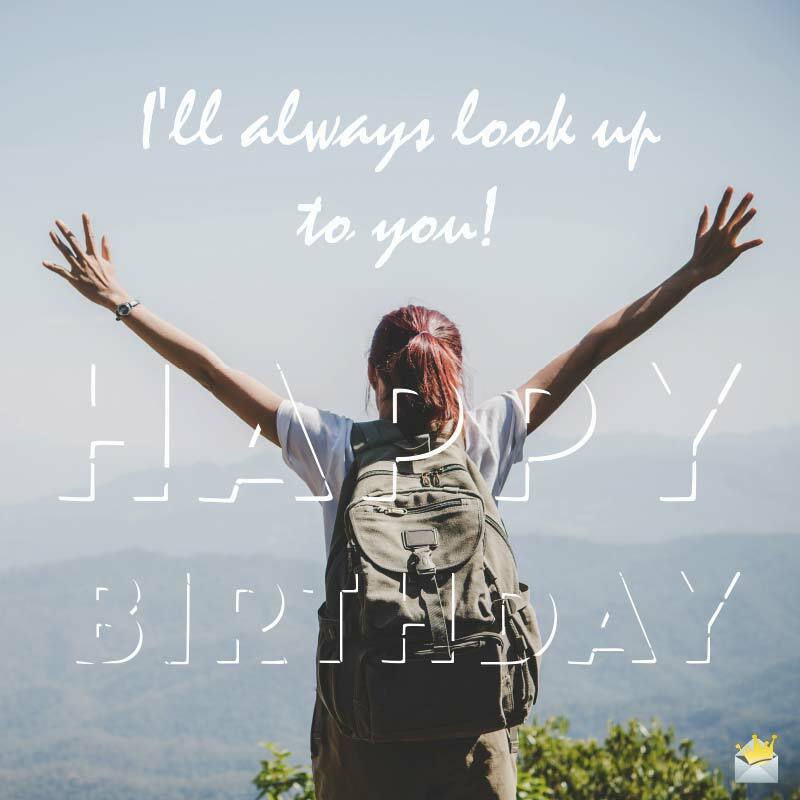 I don’t mean to sound too serious on your birthday, but as you grow, my main concern is that you devote ample time in the future to fulfilling a balanced life so that you can experience sustainable happiness. To establish a foothold on happiness in life, you must first find balance. This is why I implore you to never forget to strive for a balanced, well-rounded lifestyle. Happy birthday. Just as you prosper in your education and career, I hope that you seek balance in all areas of your life so that you can achieve peace, contentment and true happiness. I know that the past may have been unfair to you, my sweet sis, but you can secure future happiness by setting your mind on living balanced life. Happy birthday, my dearest. 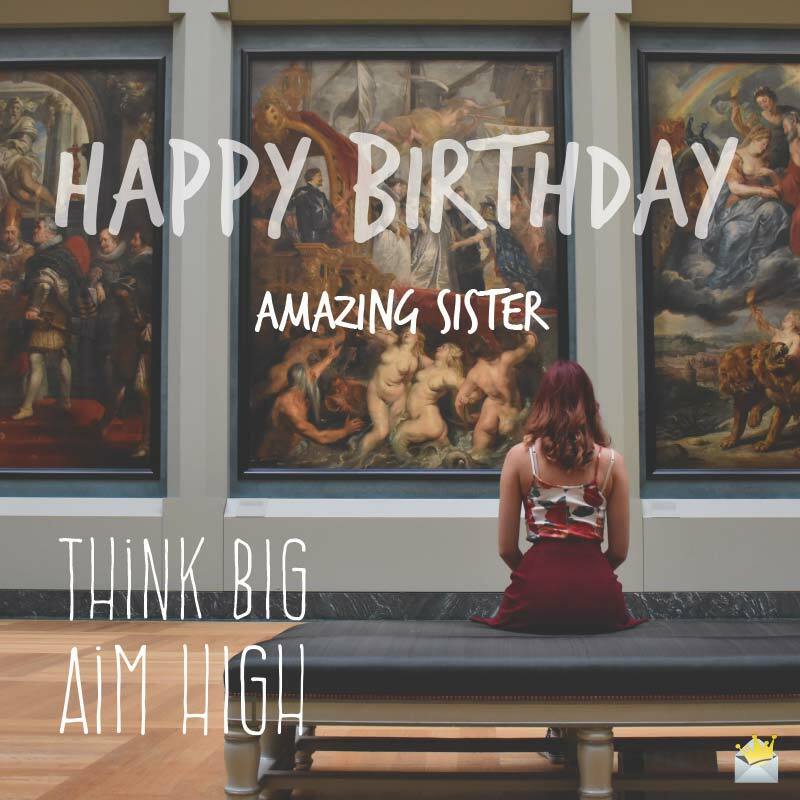 Sis, my birthday wish for you is to attain lasting happiness by putting the search for balance as your foremost pursuit in life. Have a great celebration, my dear. You are a beautiful person who I wish time nor age ever changes, but rather that you achieve balance in life in order to maximize all of your gifts. Happy birthday. 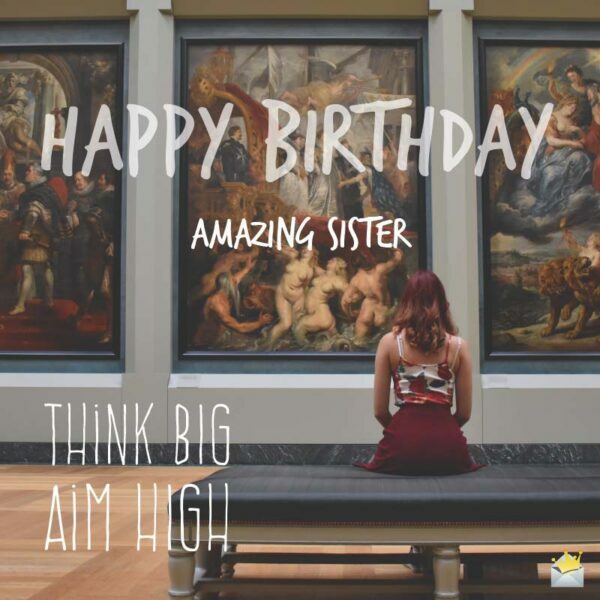 Happy Birthday, amazing sister. Thing big, aim high. I’d rather have a daughter right now than a son because women perform better in the modern economy. As you grow, take this knowledge with you and conquer the world! The world outside is ugly, but what’s living inside of you is very beautiful, and as you age, I hope you get better at letting the inside out instead of vice versa. I’ve watched you your whole life and know that you can be anything you put your mind to, and I hope as the years go by, you will increasingly come to this realization also. Happy birthday. With your level of academic success and self-discipline, I have no doubt that you will finally be the one to give our parents someone they can truly be proud of. Happy birthday. I have never forgotten all of the dreams and aspirations you have entrusted me with during our youth, and I will be there every step of the way to remind you just how close you are to achieving them. Happy birthday. Wishing the most fabulous of extraordinarily fabulous birthday to you, dear sister. May the size of your dreams only be surpassed by the magnitude of your accomplishments! I know that I’m usually an a**, but today I have to be honest and let you know that you are my role model. There are a lot more people looking up to you than you are aware of. Happy birthday. As you age and become more beautiful and successful, I pray that God will protect you from all the evil plans of the wicked and guide you to places that fill your soul with happiness. Happy birthday, my much adored sister! May life afford you all of the protection a virtuous woman such as yourself deserves in the modern world. We knew you were special since the day you were born, and now as you get ever closer to your destiny, we are all very excited to see our little sister growing up into a strong woman! You are so beautiful both inside and out, and I know that a fabulous family and glorious future are intrinsic parts of your destiny. Have a great one! Your happiness in life is largely determined by your outlook, and I hope that as your age increases so will your belief in the positive things life has in store for you. We are only granted with one life to do our best and make a positive impact on the world, and I know that before your days are finished, you will be recognized for the exceptional person that you are. Happy birthday. You possess all the BEAUTY and POWER you need to succeed. Happy Birthday Darling Sister! Sis, you have such a bright future ahead of you. As a matter of fact your future is so bright when I look at you I need sunglasses! Happy birthday. There are few thoughts that excite me more than considering what you will be able to accomplish during your lifetime with all of the talents at your disposal. Happy birthday. History has already shown us that when you focus and apply yourself, you can do great things in life, and I know that right now you are just biding time until you release all your magnificence unto the world! Have a great and bright birthday. The way I perceive your life is even in the bad times the glass is half full and never half empty, and as we set aside this special day to celebrate your existence, I hope you are reminded of how exceptional you truly are. Let me take a moment to wish my sweet sis an absolutely joyous birthday laden with immeasurable blessings. Your life is going to be as awesome as you are to me. I promise you. Happy birthday! Your journey through life will be filled with smiles and colorful rainbows because you’re blessed. I’ll always look up to you! Happy Birthday. I know that life can seem scary, but know that as you grow and venture out on your own, we’re all right here with you. Happy birthday. I am beyond proud to call you sister, and no matter how old you get, all I have will always be available to you. Happy birthday. Happy birthday to the shining star of our family. You are really the gift of grace that was bestowed upon our lives, and that is why we shall always be there for you to brighten even the darkest nights that come your way. Whenever you need a good, hearty, childlike laugh, even when you are in your granny years, know that I am always here to bring a smile to your world. Happy birthday. If you concentrate too much on the petty squabbles we have, you are going to totally miss out on how much I love you. Happy birthday, sister. I can never ever replace you with anyone in the world! Every time I remember that we are related, I am reminded that I too am capable of great things. Happy birthday, sister, and many more. Even if it seems like others have turned against you, please take note if the fact that my adoration for you is undying. I shall have your back from now until the day we are both no more.